Great value for money shredder! 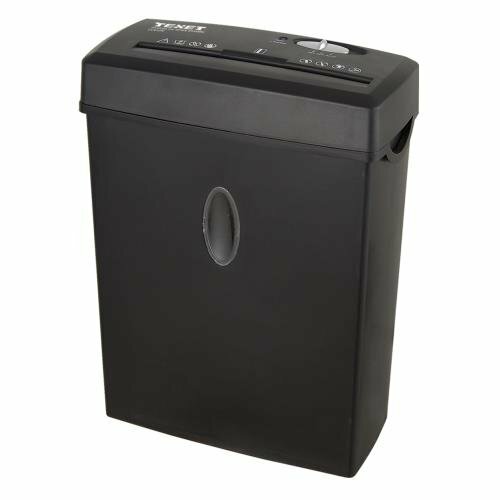 A convenient cross cut shredder with automatic stop and start control, credit card shredding capability, and reverse function. Fitting for small jobs and casual use. This handy little shredder is perfect for the home office. It’s small and compact at approximately 28 cm width, 13 cm depth, and 38 cm height, and although it doesn’t have wheels, it isn’t hard to lug around at its weight of only 3.6 kg. You shouldn’t have to move it much, though, as its compact size lets you tuck it away on a shelf or under a desk, unnoticed and inconspicuous. It’s mains powered, so you will need to have it near a socket, or have an extension cord handy. What’s notable about this little machine is its cross cutting capabilities, which assures more security than a straight cut shredder would allow. The Texet CC612N minces your sensitive documents into short strips, deterring even the most tenacious of identity thieves. Plus, this tiny shredder is also capable of cutting credit and debit cards into tiny, unrecognizable pieces, saving you time and effort every time one of your plastics expires. Believe it or not, this tidy shredder sells for around £24 on Amazon, which is pretty inexpensive for a cross cut shredder. Too good to be true? Well, this handy little machine does have its limitations. You must remove all staples before shredding, as this can mess up the gears, and you can only shred up to 6 sheets of paper at a time. You won’t even be able to shred 6 if you plan on shredding papers that are thicker than 70 grams, so it’s best to pay attention to every load you feed it. What’s particularly limiting, however, is the cool down period – you can only shred for about two minutes, after which the Texet CC612N 12L Cross Cut Shredder will automatically shut down anywhere from 15 to 30 minutes. Most shredders have a cool down period, particularly ones small enough for the home, but two minutes is on the lower end. Taking into consideration the load limitation in addition to the limited run time, you’re looking at a very small amount of work this machine can do. Not exactly ideal for a busy office setting. If you’re the type to put all your shredding aside for one bulk job at a later time, you may want to avoid buying the Texet CC612N 12L Cross Cut Shredder. It’s better for people who do a few sheets (specifically less than 6!) at a time, with a few seconds gap between each shred. This can be particularly time consuming if you have a lot of papers to go through, and requires patience that some of us don’t have to spare. You may be thinking, no big deal, I can push it a little more than advised since manufacturers always fudge the specs, right? Before you go about doing just that, a word of caution for you rebels out there. Some reviewers have noted an alarming trend: if operated past capacity, some of the machines start to smoke. Worst case scenario, they are no longer viable and are completely out of commission. Best cast scenario, they need an extended period of rest which can stretch out to an entire day. Nonetheless, as long as you keep your usage to a minimum you should be in the clear. Plus, there’s an LED indicator that lets you know when it’s on the verge of overheating. There’s also protection against overload, as well as automatic stop and start control, and a safety lock which all work together to prevent nasty accidents. As for maintenance, the blades on this machine need lubrication every month, and the manufacturer recommends Texet Lubricating Sheets LB12, which, unfortunately, isn’t included in this bundle. Aside from the shredder itself, you only receive the User Manual. Waste bags are also sold separately, so you will need to keep that in mind as well if you plan on purchasing this machine. The bin itself has a capacity of 12 litres, which admittedly isn’t very much, but at the rate the shredder operates and the amount it can handle, you shouldn’t have to empty the bin very often at all. Paper jams aren’t too common, but there’s an easy fix if you find yourself confronted with one. The manufacturing company recommends moving the switch between REV and OFF several times in order to clear any shredded paper stuck in the blades. The Texet CC612N 12L Cross Cut Shredder is small but powerful, but that comes at a price. Some customers found it a bit too loud for its size, and certainly louder than other shredders of similar size. Something to keep in mind if you or someone else in your household are sensitive to sound. Overall, this shredder is a good value for the money. Great for small jobs and maximum security for your home or small office. As long as you don’t overwork it, this shredder will serve you well. Note: Duty cycle of the machine is 2min on and 30min off.